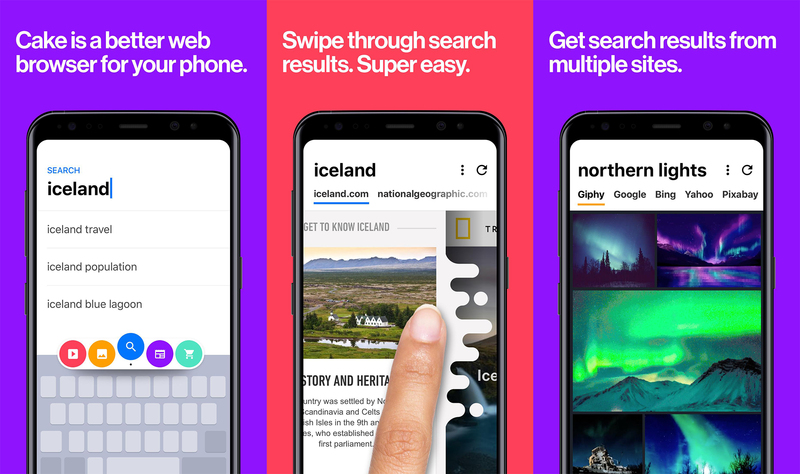 A new browser aims to take on the likes of Chrome and Firefox, but only on your phone. Cake, which has picked up a big pile of venture capital, has just launched on Android today. The developers say it's a faster and more convenient browsing experience because it was conceived of and built entirely for mobile. Is it? You can find out now. Cake is heavily focused on search, but you can enter URLs as well. When you input a search term, the browser immediately loads the top search result, but it's also loading the other search results in the background. You can swipe to the right to go through the top results, and the pages are already loaded as you get there. In the event you can't find what you want in the top few results, there's a regular search results page (your choice of Google or Bing) to the left of the first result page. You can limit your search to specific content like images or videos, and you can tell Cake which sources are more important in the settings. For instance, if you usually search for images to find GIFs, you can move Giphy to the top of the list. Cake also has a built-in ad-blocker and basic browser features like multiple tabs and bookmarks. Cake is completely free, so give it a shot.